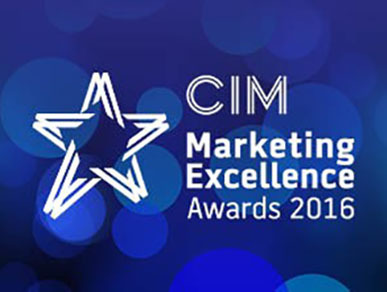 The FABRICA team are extremely proud to have been shortlisted as a finalist in two categories at this year’s prestigious CIM Marketing Excellence Awards. Nominated for the ‘Marketing Team of the Year’ category, the team are delighted to have made it as a finalist alongside other leading global brands including O2 Enterprise, Direct Line and Standard Life Investments, announced at the CIM Marketing Excellence Awards black-tie event in London on 14th April 2016. Celebrating the success of the past 12 months, the FABRICA ‘Marketing Team of the Year’ campaign clearly demonstrated the success the team has made and the real difference behind it - supported by perfect levels of teamwork, powerful insight and a carefully considered strategic approach to contribute to the marketing efforts of FABRICA and overall success of the business. Through incredible hard work, the team has successfully delivered a standout brand that is firmly ‘on the map’ and now competes with other high profile industry leaders. Each highly skilled in their area of expertise, this collaborative group of marketers succeeded not only in launching a brand, but in living and breathing the ‘skilfully produced’ promise. FABRICA were also shortlisted for 'Marketing Campaign of the Year' with joint venture partners Mount Anvil for Keybridge, the UK's tallest residential brick tower. This distinctive red brick tower stands in stark contrast to the glass and steel towers which will surround it. All marketing initiatives aimed to highlight the uniqueness of the building through a warm and emotive visual tone, encompassing the strap line: ‘Where heritage meets new heights’. It was an honour being shortlisted alongside well known brands such as Visit Britain and other large national brands. Developed to recognise and reward brilliance in the field of marketing, the CIM is the world’s leading professional marketing body who have been supporting and representing marketers for more than 100 years. The Marketing Excellence Awards have raised awareness of the creativity and originality delivered by marketers who are at the forefront of the profession. If you would like to find out more about the evening’s events, please visit the Chartered Institute of Marketing website. *Image sourced from The Chartered Institute of Marketing's website.